To Cite: Noorifard M, Dabbagh Moghaddam A, Asemi Z, Hamidi Farahani R, Mousavi Jazayeri S M, et al. Effect of Probiotic Supplementation on Oxidative Stress Enzymes and Mental Health of Athletes, Ann Mil Health Sci Res. Online ahead of Print ; 17(1):e84922. doi: 10.5812/amh.84922. Background: Extreme of professional exercise intensively increase the production of free radicals, damage to body tissues, and production of stress hormones and reduces the immune activity. The use of probiotic supplements has attracted sports community attention to promoting the health and performance of athletes. Objectives: In this study, the effect of probiotic supplementation was investigated on psychological conditions and the level of oxidative stress enzymes in athlete soldiers. Methods: This double-blind controlled trial was conducted on 40 swimmers that were randomly divided into two groups: A test group (n = 20 receiving one glass of probiotic juice daily for 12 weeks) and a control group (n = 20 receiving placebo juice for 12 weeks). The probiotic juice contained a probiotic strain of Bacillus coagulans at 1 × 109 CFU. The mental health status was evaluated by scoring on the POMS and the concentration of antioxidant enzymes and the total antioxidant capacity in blood samples were determined using the kits at the beginning and the end of the three-month post-test every 15 days. Results: After 12 weeks of intervention, a significant increase was observed in the antioxidants levels in the test group compared to the control group: SOD (43.10 ± 0.1000 vs. 28.25 ± 0.2500 u/mL; P < 0.0001), GPX (289.5 ± 1.500± vs. 160.0 ± 1.000 u/mL; P < 0.0001), total oxidative stress capacity (1.975 ± 0.005000 vs. 1.365 ± 0.005000 u/mL; P < 0.0001). In addition, psychological parameters were more favorable in the probiotic group than in the placebo group. Conclusions: Based on the results, the probiotic juice consumption has beneficial effects on the body's antioxidant system and mental health parameters in athlete soldiers. Keywords: Probiotic; Mental Conditions; Antioxidant; Stress. Stress is a necessary adaptation for homeostasis, performance, and survival. Stress response occurs when the individual experiences an unpleasant, incompatible, or threatening tension in the internal environment or in the face of external challenges. Stress and its consequences have been dealt with in a wide range of scientific studies and research (1). Sport is always a kind of stressful activity (2). Endurance athletes put their bodies in a harsh environment that causes the disruption of homeostasis and normal functioning of the body. Intense exercise for a long time leads the body to begin to respond defensively by secreting acute phase proteins, releasing hormones, and altering metabolic balance (3). In addition, endurance exercise has a profound effect on oxidative stress, intestinal permeability, muscle damage, systemic inflammation, and immune response. Oxidative stress leads to an increase in the level of oxygen radicals inside the cell, causing damage to fats, proteins, and DNA (3). Antioxidant enzymes contribute to one of the most important protective mechanisms of the body against oxidative stress. Among these enzymes, superoxide dismutase (SOD) and glutathione peroxidase (GPX) play important roles in the removal of free radicals (4). Scientists emphasize the importance of integrity and function of the digestive system and its beneficial bacteria as an effective factor in depression and other psychological disorders. Mental disorders are associated with inflammation, increased oxidative stress, and inflammatory cytokines. In fact, mood disorders and fatigue can be induced by systemic lipopolysaccharide injection (5, 6). Studies have shown that probiotics can act as a regulator and exert a positive effect on systemic cytokine, oxidative stress, and inflammatory cytokines (5). Fatigue, mood disorders, performance weakness, and gastrointestinal upset are common among athletes during training and competition (1). Recent evidence in mouse models shows a high correlation between physical and emotional stress during exercise and changes in microbial digestive compounds. For example, stress caused by the reduction of serum levels of Turicibacter spp and Ruminococcus gnavus during exercise, which plays an important role in damaging the intestinal mucosa and reducing the immune system's performance (1). Several strategies to reduce oxidative stress include the use of antioxidants, especially vitamins A, C, and E, carotenoids, polyphenols, as well as diets rich in vegetables and fruits (7-9). Probiotics have been recently proposed to reduce oxidative stress. Probiotics may reduce the oxidative stress through exerting effects such as cytokine production, IL-1 reduction and tumor necrosis factor alpha (TNF-α) and glutathione (GPX) levels increment (10). The two distinct but reciprocal systems that affect stress response during exercise include the sympathetic-adrenal-medullary (SAM) axis and the hypothalamic pituitary adrenal (HPA) axis; by activating these axes, catecholamines (norepinephrine and epinephrine) and glucocorticoids are released into the circulatory system. A systematic review of endurance exercise and gastrointestinal system assessment of the intestine indicated that intestinal microbial flora may play a key role in controlling oxidative stress and inflammatory response, as well as improving metabolism and energy consumption during intense exercise (11, 12). According to Purvis et al., it is estimated that between %20 and %60 of athletes suffer from stress due to excessive exercise and inadequate treatment (13). Considering the interaction between the intestinal axis and the brain on stress and its association with consumed food. The purpose of this study was to examine the interaction between the consumption of probiotic supplementation and stress responses induced by exercise and its effects on the health and performance of athletes. Forty athletic soldiers participated in a randomized, double-blind, controlled trial. This study was approved by the ethics committee of the AJA University of Medical Sciences (IR.AJAUMS.1394.01). The study followed the Helsinki guidelines and informed consent was received from the participants. During the study, the participants were asked to take no relaxation medication. Soldiers with specific mental disorders and smokers were excluded from the study. The athletes soldiers aged 20 to 22 years participated in the study. They were asked to refrain from the consumption of any probiotic or synbiotic food. A psychiatrist and a nutritionist supervised the study process. The participants were divided into two groups. Everyone received one glass of fruit juice a day for 12 weeks based on the following pattern: Group 1 receiving the probiotic juice and group 2 receiving only juice without supplement (placebo). The participants exercised three times a week. Each training session included swimming a total distance of 3800 m during two hours and a half. Within three months, each person recorded his diet and physical activity daily. To examine the psychological conditions of individuals, a standard questionnaire namely the Profile of Mood States (POMS) was used to determine the mood status. In addition, the final concentration of oxidative stress enzymes and total antioxidant capacity in the participants' blood were assessed using kits (Parsazmon Kit, Iran). For the first group (test), the juice contained 2×109 colony-forming units (CFU) of Bacillus coagulans (from Takgenzist Company) while the second group received non-complementary juice (placebo). The weight (kg) and body mass index (BMI) (weight in kg/square height in m2) of each person were calculated at the beginning and end of the study (week 12). Blood samples (10 mL) were collected in tubes containing EDTA before and after the exercise every two weeks. Blood samples were centrifuged immediately for seven minutes at 2700 rpm to separate the sera. Plasma was used to measure the total antioxidant capacity, erythrocytes were centrifuged for 10 minutes after three times of washing with NaCl at 4°C and used to measure glutathione peroxidase and superoxide dismutase activity. From the beginning until the end of the study, blood samples were taken from each person every three days, as well as 15 days before and after the exercise training (swimming 3800 m). Blood samples were collected in EDTA-containing tubes. The samples were centrifuged (Hettich D-78532, Tuttlingen, Germany) to collect the sera. The activity of superoxide dismutase (SOD) and glutathione peroxidase (GPX) in blood samples collected diagnostic kit respectively by Zelbo (ZB- (SOD-48A, ZB-GPX-48A) were investigated. To measure the activity of superoxide dismutase, xanthine, and xanthine oxidase, superoxide radicals were used to react with a substance called phenyl tetrazolium chloride and form a complex of formazan. The enzyme activity and optical absorption of this reaction were measured at 505 nm (14). Glutathione peroxidase oxidizes glutathione and the glutathione peroxidase oxidizes glutathione, and the oxidized glutathione, will be reduced again by glutathione reductase and NADPH. In this reaction, NADP+ is also produced. The glutathione peroxidase activity was determined by measuring the absorption of light at 340 nm (15). The ZellBio assay kits (ZA-TAC-48A) were used to determine the total antioxidant capacity. In this method, the ability of plasma to reduce iron was measured. By regenerating ferric ions (Fe+3) in acidic pH, converting it into Ferro (Fe+2) and creating proprietary reagents, the blue complex was created and quantified at 593 nm wavelength (16). The Kolmogorov-Smirnov test was used to determine the normal distribution of variables. An analysis of variance (ANOVA) was used to determine the effects of probiotic juice and placebo on oxidative stress biomarkers and psychological conditions in the two groups. The paired samples t-test was used to identify the intragroup differences (beginning and the end of the experiment). The independent samples t-test was used to diagnose the differences in general characteristics between the two groups. P values of less than 0.05 were considered significant. All statistical analyses were performed using the Statistical Package for the Social Sciences version 18, 2011 version 18 software (SPSS Inc., Chicago, Illinois, USA). Two out of 42 participants in the study were excluded due to non-compliance with the inclusion criteria. 40 subjects (20 in each group) completed the test. After taking the probiotic juice during the study, no side effects were reported. During the first month of the experiment, no significant changes were observed in the level of oxidative stress enzymes and the mental concentration level of the two groups. With increasing the probiotic supplementation time (six weeks before the end of the study), the test group showed a significant increase in SOD compared to the control group (43.10 ± 0.1000 vs. 28.25 ± 0.2500 u/mL; P < 0.0001) and GPX (289.5 ± 1.500 vs. 160.0 ± 1.000 u/mL; P < 0.0001), total oxidative stress capacity (1.975 ± 0.005 vs. 1.365 ± 0.005 u/mL; P < 0.0001) (Table 2). In addition, there was a significant reduction in stress (stress, anger, fear, etc.) after taking probiotic supplementation compared to the placebo group. The mean age, height, weight, and BMI at baseline and 12 weeks after the analysis in both groups showed no significant difference (Table 1). b Obtained from the independent t-test. In this study, the effect of probiotic juice consumption of Bacillus coagulans was investigated on oxidative stress biomarkers and psychological conditions of swimmer soldiers for 12 weeks. The results showed that probiotic juice had favorable effects on the reduction of oxidative stress biomarkers of athletic soldiers. In the course of the intense exercise, the extent of metabolism in skeletal muscles increases by 100 times compared to the resting state. With a significant increase in oxygen consumption, the production of superoxide anions increases in mitochondria. Probiotics can reduce the risk of developing respiratory and digestive diseases during stressful exercise sessions by altering the natural flora of the body and maintaining the integrity of the mucosal defense system in the respiratory and digestive system (18). Athletes are reported to have a strong antioxidant defense system. Continuous intense exercise increases the number of free radicals and regulates the expression of antioxidant enzymes. However, hard and prolonged exercise can increase the athlete's sensitivity to exercise-induced oxidative damage (18). The results of Mishra et al. showed that probiotics enhance the antioxidant system by increasing the production of antioxidant peptides and repairing the intestinal microbial flora (19). Other studies have proven the effects of probiotic lactobacilli antioxidants. In addition, other probiotic species have shown beneficial effects on the protein-induced oxidation of exercise. The effects of using probiotic supplements on the concentration of superoxide dismutase, glutathione reductase, and catalase enzymes have been proven in previous studies (18). In another part of our study, probiotic juice was used to improve the mental condition of individuals. Some studies have suggested that intestinal microbiota, modified by probiotic supplementation, can significantly reduce the anxiety score and treatment anxiety disorders. Pinto-Sanchez et al. showed that a probiotic (called Bifidobacterium longum called BL) could reduce the anxiety scores and increase the quality of life of patients. The results of the mentioned study confirm the results of our study (20). The results of Akkasheh et al. study are correspond with our findings and show that probiotic supplementation has a positive effect on depression (21). Gut bacteria play an important role in many aspects of biology, including metabolism, endocrine gland secretion, neuronal function, and immune function. In another 14-day study, the combination of Lactobacillus helveticus and Bifidobacterium longum reduced anxiety behavior in Wistar rats and probiotics probably reduced hypothalamus-pituitary-adrenal axes (HPA) and autonomic nervous system (ANS) activity (22). In 2013, Ohland et al. measured the effect of Lactobacillus helveticus on anxiety behaviors. Examining the results showed that probiotics can control host physiological function (23). Another study showed that the daily intake of Bifidobacterium longum and Bifidobacterium berry reduced anxiety in mice (24). A study by Wang et al. showed that Lactobacillus fermentum strain NS9 had beneficial effects on mental health and could reverse physiological and psychological abnormalities in mice (25). The use of Bifidobacterium longum R0175 for 30 days reduced the anxiety and stress levels in individuals and caused a significant improvement in anxiety and depression (26). In human, Lactobacillus rhamnosus could increase antioxidant activity under physical stress conditions (27). According to the results of this study and other studies, it can be concluded that probiotic supplements can be considered an appropriate medication without side effects for increasing the antioxidant system performance and improving the mental status of the persons. This study was conducted with the support of the staff of the Faculty of Medicine, AJA University of Medical Sciences. Conflict of Interests: There is no conflicts of interest. Ethical Considerations: The study was conducted in accordance with the Helsinki Statement and under the supervision of the Medical Ethics Committee of the Faculty of Medicine, AJA University of Medical Sciences. (ethical code IR.AJAUMS.1394.01). Funding/Support: This research was funded by Seyed Milad Mousavi Jazayeri. 1. Clark A, Mach N. Exercise-induced stress behavior, gut-microbiota-brain axis and diet: A systematic review for athletes. J Int Soc Sports Nutr. 2016;13:43. doi: 10.1186/s12970-016-0155-6. [PubMed: 27924137]. [PubMed Central: PMC5121944]. 2. Ramazaninezhad R. Study of the stressful factors of athletes of selected national teams of Iran. J Manage Exerc Dev. 2017;5(2):127-45. 3. Mach N, Fuster-Botella D. Endurance exercise and gut microbiota: A review. J Sport Health Sci. 2017;6(2):179-97. doi: 10.1016/j.jshs.2016.05.001. [PubMed: 30356594]. [PubMed Central: PMC6188999]. 4. Negahdar M. Evaluation of the activity of superoxide disodotus glutathione peroxidase enzymes, erythrocyte catalase in smokers and non-smokers working in Kurdistan University of Medical Sciences. J Kurdistan Med. 2008;12:1-7. 5. Martarelli D, Verdenelli MC, Scuri S, Cocchioni M, Silvi S, Cecchini C, et al. Effect of a probiotic intake on oxidant and antioxidant parameters in plasma of athletes during intense exercise training. Curr Microbiol. 2011;62(6):1689-96. doi: 10.1007/s00284-011-9915-3. [PubMed: 21400082]. 6. Reichenberg A, Yirmiya R, Schuld A, Kraus T, Haack M, Morag A, et al. Cytokine-associated emotional and cognitive disturbances in humans. Arch Gen Psychiatry. 2001;58(5):445-52. [PubMed: 11343523]. 7. Zablocka A, Janusz M. [The two faces of reactive oxygen species]. Postepy Hig Med Dosw (Online). 2008;62:118-24. Polish. [PubMed: 18388851]. 8. Sies H, Stahl W. Vitamins E and C, beta-carotene, and other carotenoids as antioxidants. Am J Clin Nutr. 1995;62(6 Suppl):1315S-21S. doi: 10.1093/ajcn/62.6.1315S. [PubMed: 7495226]. 9. Zhang X, Tao N, Wang X, Chen F, Wang M. The colorants, antioxidants, and toxicants from nonenzymatic browning reactions and the impacts of dietary polyphenols on their thermal formation. Food Funct. 2015;6(2):345-55. doi: 10.1039/c4fo00996g. [PubMed: 25468403]. 10. Asemi Z, Jazayeri S, Najafi M, Samimi M, Mofid V, Shidfar F, et al. 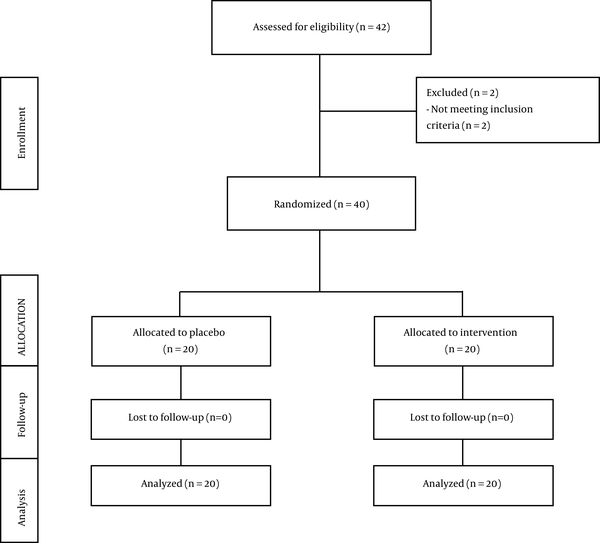 Effect of daily consumption of probiotic yogurt on oxidative stress in pregnant women: A randomized controlled clinical trial. Ann Nutr Metab. 2012;60(1):62-8. doi: 10.1159/000335468. [PubMed: 22338626]. 11. Ulrich-Lai YM, Herman JP. Neural regulation of endocrine and autonomic stress responses. Nat Rev Neurosci. 2009;10(6):397-409. doi: 10.1038/nrn2647. [PubMed: 19469025]. [PubMed Central: PMC4240627]. 12. Martins AS, Crescenzi A, Stern JE, Bordin S, Michelini LC. Hypertension and exercise training differentially affect oxytocin and oxytocin receptor expression in the brain. Hypertension. 2005;46(4):1004-9. doi: 10.1161/01.HYP.0000175812.03322.59. [PubMed: 16157794]. 13. Purvis D, Gonsalves S, Deuster PA. Physiological and psychological fatigue in extreme conditions: Overtraining and elite athletes. PM R. 2010;2(5):442-50. doi: 10.1016/j.pmrj.2010.03.025. [PubMed: 20656626]. 14. L'Abbé MR, Fischer PWF. Automated assay of superoxide dismutase in blood. In: Packer L, Glazer AN, editors. Methods in enzymology. 186. Elsevier; 1990. p. 232-7. doi: 10.1016/0076-6879(90)86113-A. 15. Paglia DE, Valentine WN. Studies on the quantitative and qualitative characterization of erythrocyte glutathione peroxidase. J Lab Clin Med. 1967;70(1):158-69. [PubMed: 6066618]. 16. Zarban A. Investigation of pattern of changes in antioxidant capacity in breastfeeding during the first six months of breastfeeding. J Iran Child Dis. 2007;17(1):34-40. 17. Morfeld M, Petersen C, Kruger-Bodeker A, von Mackensen S, Bullinger M. The assessment of mood at workplace-psychometric analyses of the revised profile of mood states (POMS) questionnaire. Psychosoc Med. 2007;4:Doc06. [PubMed: 19742299]. [PubMed Central: PMC2736534]. 18. Pyne DB, West NP, Cox AJ, Cripps AW. Probiotics supplementation for athletes-clinical and physiological effects. Eur J Sport Sci. 2015;15(1):63-72. doi: 10.1080/17461391.2014.971879. [PubMed: 25339255]. 19. Mishra V, Shah C, Mokashe N, Chavan R, Yadav H, Prajapati J. Probiotics as potential antioxidants: A systematic review. J Agric Food Chem. 2015;63(14):3615-26. doi: 10.1021/jf506326t. [PubMed: 25808285]. 20. Pinto-Sanchez MI, Hall GB, Ghajar K, Nardelli A, Bolino C, Lau JT, et al. Probiotic Bifidobacterium longum NCC3001 reduces depression scores and alters brain activity: A pilot study in patients with irritable bowel syndrome. Gastroenterology. 2017;153(2):448-459. e8. doi: 10.1053/j.gastro.2017.05.003. [PubMed: 28483500]. 21. Akkasheh G, Kashani-Poor Z, Tajabadi-Ebrahimi M, Jafari P, Akbari H, Taghizadeh M, et al. Clinical and metabolic response to probiotic administration in patients with major depressive disorder: A randomized, double-blind, placebo-controlled trial. Nutrition. 2016;32(3):315-20. doi: 10.1016/j.nut.2015.09.003. [PubMed: 26706022]. 22. Arseneault-Breard J, Rondeau I, Gilbert K, Girard SA, Tompkins TA, Godbout R, et al. Combination of Lactobacillus helveticus R0052 and Bifidobacterium longum R0175 reduces post-myocardial infarction depression symptoms and restores intestinal permeability in a rat model. Br J Nutr. 2012;107(12):1793-9. doi: 10.1017/S0007114511005137. [PubMed: 21933458]. 23. Ohland CL, Kish L, Bell H, Thiesen A, Hotte N, Pankiv E, et al. Effects of Lactobacillus helveticus on murine behavior are dependent on diet and genotype and correlate with alterations in the gut microbiome. Psychoneuroendocrinology. 2013;38(9):1738-47. doi: 10.1016/j.psyneuen.2013.02.008. [PubMed: 23566632]. 24. Huang R, Ning H, Yang L, Jia C, Yang F, Xu G, et al. Efficacy of probiotics on anxiety: A meta-analysis of randomized controlled trials. Neuropsychiatry. 2017;7(6):862-71. 25. Wang T, Hu X, Liang S, Li W, Wu X, Wang L, et al. Lactobacillus fermentum NS9 restores the antibiotic induced physiological and psychological abnormalities in rats. Benef Microbes. 2015;6(5):707-17. doi: 10.3920/BM2014.0177. [PubMed: 25869281]. 26. Messaoudi M, Violle N, Bisson JF, Desor D, Javelot H, Rougeot C. Beneficial psychological effects of a probiotic formulation (Lactobacillus helveticus R0052 and Bifidobacterium longum R0175) in healthy human volunteers. Gut Microbes. 2011;2(4):256-61. doi: 10.4161/gmic.2.4.16108. [PubMed: 21983070]. 27. Wang Y, Wu Y, Wang Y, Xu H, Mei X, Yu D, et al. Antioxidant properties of probiotic bacteria. Nutrients. 2017;9(5). doi: 10.3390/nu9050521. [PubMed: 28534820]. [PubMed Central: PMC5452251].